First off, please excuse the slightly blurred images in my full-length photos. These were the first OOTD photos I ever took on my Sony A5000, other than the mirror ones, so whilst they looked fine on the image viewer, obviously it's better to check on the laptop first! I sharpened them a bit to make them look a bit better. Regardless, I loved the photos so I didn't really want to retake them, but I'll keep an eye out for this in future photos. In recent months, midi skirts have taken the world by storm. Don't get me wrong, they've been popular since my teens, but ever since the tail end of 2016, I've been seeing them everywhere. 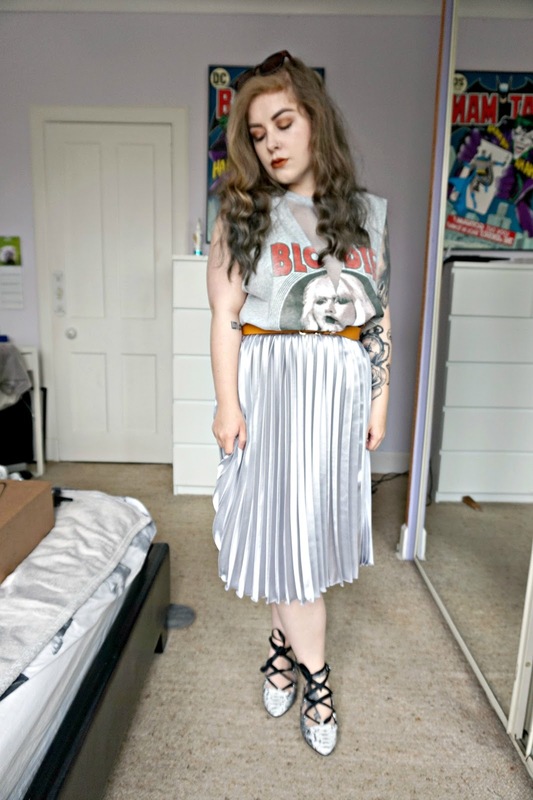 In particular, I've been seeing pleated, satiny kinds, like I'm wearing in the photos above, and for this reason I thought I'd pop on with a little outfit inspired by warmer, summer weather of one of the ways you can style a pleated midi. These are by far one of the comfiest and breeziest pieces of clothing to wear during the summer, and the thing I love about the pleating is that it hides any food babies or general muffin tops from view, but cinching in the waist allows you to still maintain a defined figure. For the last few years I've been a fan of defining my waist, but the issue I have is that many slim fitting midis can end up emphasising my muffin top, as opposed to helping disguise it, so the pleats are perfect for this. Most midis are too long on me, sitting nearer ankle length than below-knee, which is where I like them to sit. I think this feels most comfortable and flattering on me as I'm a teeny 5'1, with big thighs, chest and bum. I'm not often one to elongate my body, instead I just prefer to define my shape. I need to roll the waistband of my satiny Primark midis (I have one in khaki too) over about 4-5 times to get it to sit at the right length on me, but as you can imagine, this often leaves me with a bumpy, silly looking waist. To cancel this out, I always opt to wear a belt with my midis, even if they are elasticated at the waist and therefore fit well. As I wear them quite high up, I have to add a whole in them with a knife to get that perfect, snug fit. So, for this outfit I chose my silver midi as it's the one that sees the least light of day. It's such a perfect summer colour, but since summer is so limited in Scotland I know I need to come up with ways to try and wear it a bit more even in the colder months. I often team midis with either a crop top and Converse, or an oversized tee and ankle boots, sometimes with a leather jacket for some added edge (like this OOTD), but I wanted to style it a little bit differently. I opted for my baggy, oversized Blondie tank top that I recently bought from Forever 21 - I've wanted a nice Blondie top for aaaages, and this one was so perfect that I couldn't resist! -, not only do I think the loose fit will keep you cool (you can wear a vest under if you prefer, but I decided not to wear one) and the mesh panelling adds some interesting detail as well as being another factor to help with the summer heat. Since the tank top already has citrus tones in it, I chose my mustard belt instead of plain ol' black to slip around my waist and accentuate it, and then I went for my snake print lace-up flats for a girly look, although I admit that I'd probably just chuck on some Converse normally because they are so comfortable and effortless. Personally I think this makes a really nice outfit for a day hanging out having a picnic with your SO, but it can easily be dressed up with heels or dressed down with a casual jacket if it's looking too feminine for you. Do you like the pleated midi skirt trend? How do you style yours?